Keeping your swimming pool clean and welcoming is a job that needs regular attention. Luckily, with the right chemicals and a bit of elbow grease, you can make sure your pool stays in top shape all season long. Whether you plan on maintaining the chemicals yourself or you’d rather leave the hard work to the professionals at Aqua Spas & Pools, it is important that you use the right chemicals, at the right time. As your full-service pool and spa retailer, we carry all the chemicals and pool accessories you may need, we can go through the entire process with you as well. When you first invest in a pool for your family you may think that the chemicals needed to keep the water safe and clean sound like a long list of additional items. But in reality, these chemicals are a must! Especially if you want to avoid grime buildup and other debris from wreaking havoc on your pool water. Over time, you will become more familiar with the chemical treatment process and be happy that you know how to keep your pool clean and inviting. This is the most common and widely used pool sanitizer. You can get chlorine for your pool in a variety of mediums including liquid form, granular and tablets. Many pool owners find chlorine tablets are the best choice for a constant supply of chlorine, while the other 2 are most often used to shock the pool. Other ways chlorine can be used in your pool include chlorine generators or salt systems. For outdoor pools that are exposed to a lot of sunlight, stabilized chlorine can help keep the water clean and germ-free. Saltwater – Saltwater pools naturally generate chlorine in a way that does not irritate the eyes or skin. The salt is passed through a salt cell, where it then receives an electric charge that breaks it down into chlorine. Bromine – Most often used in spas, Bromine is more convenient than chlorine, but can be more pricey too. 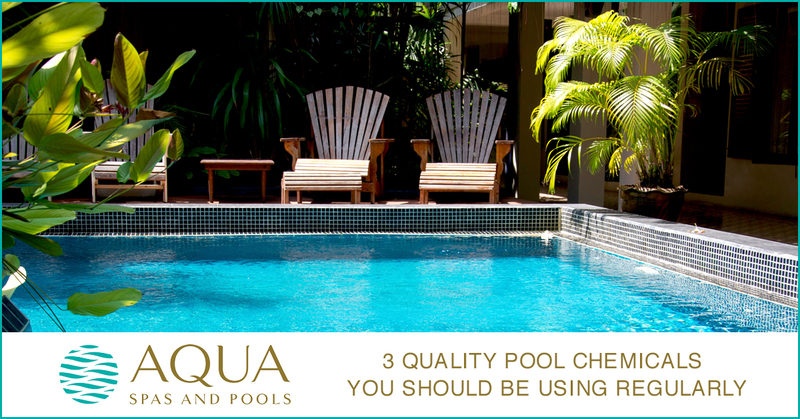 With this pool chemical, your water doesn’t need to be tested as often and should stay balanced for a longer period of time. 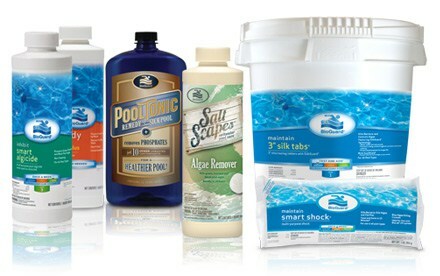 These are the chemicals used to aid the sanitizers in your pool, they can also control the growth of algae and bacteria. For clean and clear water, shock treatments should be added to your pool on a weekly or bi-weekly basis. If you are unsure how often you should shock your pool our experienced technicians can help you figure out a schedule, to keep your pool clean and clear. While most of the chemical treatments needed to keep your pool clean can be maintained on your own, it pays to have professional advice and services just a phone call away. For more information on the full list of services available at Aqua Spas & Pools, be sure to visit our team online today!